The Ford Pre-Paid Maintenance Plans make it easy to ensure that your vehicle gets the recommended scheduled maintenance as outlined in your vehicle’s Owner’s Guide. It is necessary to keep up on these routine maintenance services to proactively keep your vehicle running with optimal performance. There are a variety of plans being offered by Ford Canada to allow you to choose the plan that best suits your vehicle and situation. Taking your vehicle’s servicing seriously, the Ford Maintenance Protection Plan (FMPP) offers premium coverage and regularly scheduled maintenance for Ford vehicles as outlined in the Owner’s Guide. Start your vehicle’s life out on the right foot with pre-paid maintenance and relax in knowing that you are protected as you go. Through this plan, you are offered optional first-day rental coverage and rental vehicle reimbursement when receiving covered maintenance services so that you never have to go without a vehicle. Take advantage of the $0 deductible with the FMPP, and do not hesitate to maintain your vehicle according to Ford’s scheduled maintenance requirements. This plan may be purchased on Ford vehicles anytime before the earlier of 12 months or 20,000 km from the warranty start date. Take as much caution with a pre-owned vehicle as you would a brand-new one through the Limited Maintenance Plan (LMP). If you drive a pre-owned Ford, Lincoln, Mercury or competitive-make vehicle, you are eligible for coverage under this plan, including regular maintenance services, such as engine oil and filter change, multi-point inspection and tire rotation. Achieve confidence on the road ahead through the available road assistance, which offers a series of included services for unexpected trouble on the go. Depending on the time and distances that you drive, you are able to select a customized plan with a selected number of maximum service visits. To purchase a Ford pre-paid maintenance plan for you vehicle, or for more information, please see Watkin Motors Ford. Your vehicle provides for you a comforting and dynamic experience on the road, and you deserve to ensure that it continues to run in optimal condition with a full coverage protection. 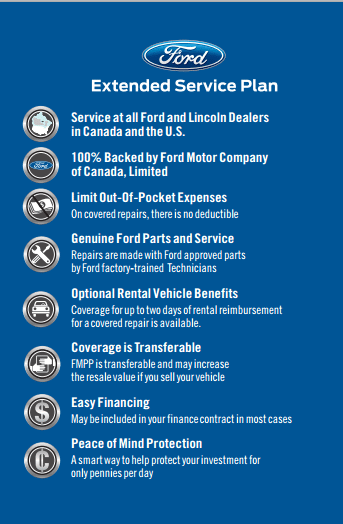 The pre-paid maintenance plans and ESPs are 100% backed by Ford Motor Company of Canada, Limited and are honoured at every authorized Ford and Lincoln Dealer across Canada and the United States (Lincoln Maintenance Protection Plan is honoured at every authorized Lincoln Dealer in Canada and the United States). By acquiring a plan, you allow for regularly scheduled maintenance services by Ford-Trained Technicians using Ford approved parts, because quality should never be compromised on. If the time comes to sell your vehicle, having kept up on maintenance can increase the value of your vehicle, as well as the added value of the remaining FMPP prepaid maintenance coverage. FMPP coverage may be transferred to a new owner as long as this transfer occurs within 90 days of the purchase date of the vehicle (except where prohibited by law). The Limited Maintenance Plan is not transferable. Allow uncompromising confidence to accompany you on every journey. Visit with your local Okanagan Valley Ford Dealer - Watkin Motors Ford to learn more about the Pre-paid Maintenance Plans from Ford. Check out the new and pre-owned Ford vehicles in inventory and consider a plan to enhance your ownership. Watkin Motors Ford offers exceptional sales and service to give you added confidence when you’re out on the road. Providing the foundation for extended service plans, the powertrain ESP covers 29 vehicle components and offers an available roadside assistance. Including the components covered by PowertrainCARE, this ESP offers a broader protection with 84 covered components as well as roadside assistance. Taking the coverage offered by PowertrainCARE and BasicCARE, this extended service plan provides additional high-tech coverage with 113 covered vehicle components and included roadside assistance. This extended service plan is the ultimate plan, providing you with coverage for almost everything through with 1,000 vehicle components. You are offered extended roadside assistance, up to 10 days of rental vehicle reimbursement, optional rental plus vehicle reimbursement, and a standard $100 deductible. Driving a diesel does not mean that you cannot be covered through an ESP. This ESP is custom-made specifically for Ford diesel vehicle owners and takes your NEW Vehicle Limited Warranty and offers confidence on the road through additional roadside assistance, as well as rental vehicle benefits and vehicle reimbursement. Engage in coverage for immediate first-day rental services as well as roadside assistance and up to 3 days of rental vehicle reimbursement on a covered repair. Experience the open road with confidence, as you trust in the Ford Extended Service Plan being offered to you. In addition to a pre-paid maintenance plan, which ensures your vehicle is being cared for, an ESP can provide for you if and when something unexpected happens. If your New Vehicle Basic Warranty is nearing expiration, or has expired altogether, you can benefit from an ESP to help with the rising costs of maintenance and repairs.